In the early hours of November 9th you woke to nurse. I flipped on the television as I couldn’t bear to stay awake that election night. Just moments before I turned on my screen, it was official: the woman I believed would shatter the glass ceiling of the most powerful position on earth lost to a candidate who built his entire campaign on misogyny, racism, and lies. As I fed you my tears fell all over your little body. My dear Inez, this is not the reality I planned for you. You see, my love, I named you after my favorite woman in history, Inez Milholland Boissevain. I hope you aspire to emulate your life after Inez Milholland, who was a strong, gutsy, and passionate woman. You should know a little about her. Inez Milholland was a passionate feminist and social justice advocate and a woman completely ahead of her time. She attended Vassar College in the early 1900s. There she was captain of her hockey team, ran track, and broke records in basketball. She started a Votes for Women Club where, by the time she graduated in 1909, more than two-thirds of the student body had joined. After Vassar, Milholland applied to several Ivy League law schools, but was denied because of her gender. However, that didn’t stop her. Milholland eventually earned a law degree from New York University School of Law. As a lawyer, she worked for prison reform, labor reform, and women’s rights. She was an advocate for rights of African Americans and was a member of the NAACP. And when she fell in love with her partner Eugen Jan Boissevain she proposed to him. Milholland died in November 1916 after collapsing during a speech in Los Angeles, right after the sentence: "How long, Mr. President, must women wait for liberty?" Her martyrship for women’s rights only further cemented her Joan of Arc image. Milholland died one hundred years ago but we find ourselves still asking today “how long must women wait for liberty?” Next week, hundreds of thousands of women will take to the streets in women’s rights marches to coincide with a presidential inauguration, just as Milholland famously did when she rode that white horse down Pennsylvania Avenue. In addition to the historic march in D.C., actions are planned in all fifty states and more than sixty other global cities will march in solidarity. Women everywhere will be marching for women's equality, reproductive rights and healthcare, racial justice, LGBTQ equality, environmental justice, economic opportunity, peace and nonviolence, and religious freedom. I know many women, like myself, who will also be marching because the sexism in our places of worship give our politicians and others permission to discriminate against women by their example of exclusion. Tomorrow is my ninth anniversary working at the Women’s Ordination Conference (WOC). For more than forty years, WOC has tirelessly advocated for women’s equality in the Roman Catholic Church. We know that when our church and religious leaders treat women and girls with dignity, respect, value their wisdom, and work alongside them as equals, then others do, too. Far too often people hear from pulpits that women must be silent. For far too long women and girls have been denied the visual of seeing a woman celebrate Mass or in other important leadership roles. We are treated as second class citizens in a faith that we love, which why we hold vigils, march, and speak out. Some of my friends have even broken the unjust canon law that prohibits them from being priests by becoming ordained in organizations like Roman Catholic Womenpriests. Others celebrate eucharist as a discipleship of equals. Each of these actions make a difference. 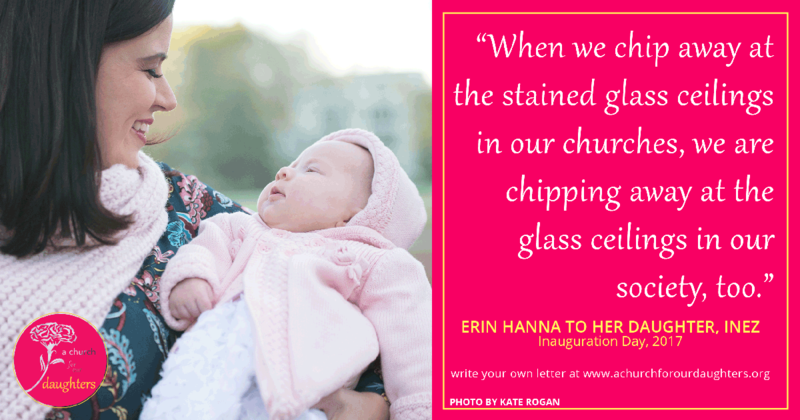 When we chip away at the stained glass ceilings in our churches, we are chipping away at the glass ceilings in our society, too. My sweet Inez, you may only turn four months old on Saturday, and you will never remember being at the Women’s March, but I promise to remind you that our family braved the cold because women are tired of waiting for liberty. Inez, you deserve to grow up in a world that values women and girls. If you want to be president of the United States, a Catholic priest, or whatever you dream of, I want those things to be obvious options, not impossible ones. That’s why on Saturday, I will march for you. Like so many moms, I dream of a world that is better — more just — for our daughters than the one we had growing up. I love you, and I am so grateful to be your mom.